﻿﻿Training your mind to become more aware of each present moment will strengthen your immune system, grow grey matter in your brain and raise your baseline level of happiness﻿. Mind training through meditation may enhance your spiritual life while not interfering with your belief system, for mind training through meditation is a practice (akin to weight lifting), not a belief system. If you have a religious faith you don’t have to worry that meditation will turn you from it. Instead, the practice will augment your life by making you more ‘available’ to the stirrings of spirit within and more open to the wonder of being alive. If you’re not spiritually inclined, no problem, because, again, mind training through meditation is not a belief system. 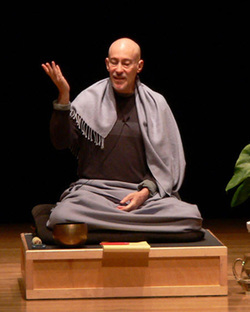 There are a growing number of mind training, or meditation, methods and teachers. We’ve worked with Shinzen Young for several years now and appreciate his clarity in teaching and his dedication to his students. We’re open to listing other teachers and programs so please contact us for listing opportunities.